Nightbreed‘s production and release history is well-known. The rumors of a “director’s cut” well chronicled. So I won’t dish you a history lesson, after all, that’s what Scream Factory’s deluxe Blu-ray edition is here for and it does it very well. But, I am here to tell you that after long last, it appears we finally have a cut of Nightbreed that feels more satisfying and cohesive. The theatrical cut was a choppy and hurried. Totally satisfactory, but far from being a home run. The Director’s Cut smooths things out, adds more significance to protagonist Boone, places more emotional weight on his relationship with Lori and injects extra dramatic layers to make the denizens of Midian more sympathetic. 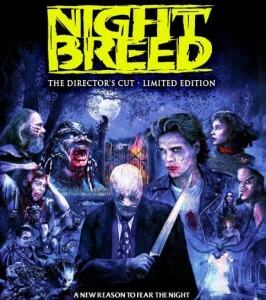 Nightbreed‘s Director Cut is a mix of the theatrical version and the festival-touring Cabal Cut (which is significantly longer in length and far too bloated a cut to release on its own – read my review of that here). There’s 40 minutes of new material (deleted scenes and alternate takes) in the Director’s Cut which runs 18 minutes longer than the theatrical version. The team behind the Director’s Cut truly acted as sculptors before a block of clay, molding it into a more comprehensive telling of a man who feels the pull to join the monsters of Midian only to be their harbinger of doom and, ultimately, their leader. Is this the definitive cut? As someone who has seen all that there is to offer based on the theatrical version and the Cabal Cut, I would say yes: This is the definitive version. Any flaws that come out of it are based purely on creative choices, the writing or the acting. The Director’s Cut places Boone and Lori first and although they may spend most of the time apart in the story, the film begins with them and ends with them in a totally different fashion. The love story arc is present and reinforced by some new footage represented mostly in the first act as Boone struggles with information David Cronenberg’s Decker has given him. During one fiery sequence, he sees visions of himself taking Lori to bed. This scene also helps ease us into the moment in which Boone – under the influence of drugs – wanders into the path of an oncoming truck (in the theatrical cut, it’s a scene we as an audience are abruptly thrown into). There’s the inclusion of more Lori material as well. For instance, we actually seen her performing on stage – something I felt carried on a bit too long in the Cabal Cut, but it’s palatable here. Also noticeably different is Decker’s role in everything. He’s still a presence, but with more material fleshing out the story this time, it feels like there’s less of an emphasis on him. But what fans will take away from this cut most of all is the heavy thematic emphasis on “us vs. them” – “Humans vs. Nightbreed,” misunderstood monsters being forced to flee their home and defend themselves. It was apparent in the theatrical and Cabal Cut, but the third act of the Director’s Cut really drives it home. When Captain Eigerman rallies the troops, they’re more threatening and the attack on Midian comes across as straight-up devastating. Boone himself even comes out of the Director’s Cut as a stronger leader through some extra footage. Meanwhile, Ashbury (Malcolm Smith, who I was never a fan of in the role) takes the spotlight as a character who was obviously being set up as the prime villain in a sequel that never happened. And for those who never read about Nightbreed‘s history of cuts and alternate scenes, I’ll spare you the details of one of the larger differences between the Director’s Cut and the theatrical version. It’s a malicious creative decision on Barker’s part and I liked it. Technically, Scream Factory and the team behind this cut have done a phenomenal job on picture and sound, given the circumstances. There was only one glaring bit of editing involving new footage that bothered me – it occurs during Boone’s “resurrection” and his escape out of a window. Also, I’ve always had a plot hole problem that I thought would be resolved here. How the hell does Narcisse get from the hospital and away from the authorities to Midian? I suppose there was no footage or dialogue to explain this away. Nightbreed: The Director’s Cut is the one the fans have been waiting for, no doubt about that. At two hours in length – and with the reworked/new footage – you get a definite sense that there was a larger world to explore with these characters. Barker was going “big” and he did the best he could with the budget he was allotted. Perhaps all of this renewed interest in Nightbreed this year will pave the way for more stories.